After all, it’s an eight-hour drive from Winnipeg, a flight can prove costly, especially if you’re not travelling solo, and without a vehicle, getting around may be a little more painstaking. But for the true explorer, these are merely bumps in the road on the journey to new and amazing discoveries. For those still unconvinced, then I’d suggest that you forget everything you’ve ever heard about Thompson and make a point of filling that freshly blank slate with your own informed opinions that will give you a new perspective on this 62-year-old city. Whether you choose to visit this museum upon your arrival in Thompson, or you decide to visit upon your departure is entirely up to you. The only advice that I would offer is that you really should visit. While Heritage North Museum bears many similarities to other museums centred on Manitoba’s pioneering past, it goes a step further in truly getting to the heart of the Thompson identity. Not only will you see much of the wildlife native to the area housed in this grand spruce wood log structure, you will also gain a better understanding of how this mining town came to be. This isn’t a tour you should rush through either, especially if you are fortunate enough to have it with volunteer staff Doreen Lindquist. Lindquist has not only put her heart and soul into this museum, she was also one of the first residents of the city and one of its first schoolteachers. Lindquist’s remarkable insights and insider’s perspective on what makes Thompson so special and so unique would certainly make you understand this city in a new light. Not even the most Instagrammable moments can do this place justice. Pisew Falls is one of those places you need to experience for yourself. This is where the Grass River winds its way down a 45-plus-foot drop of dangerous yet mesmerizing, rough yet soothing waters. Pisew means lynx in the Cree language and the falls were so named as its sound is said to resemble that of its namesake. The boardwalks offer the convenience of two vantage points where you get to see nature perform with no props necessary from its awe-filled audience. If you have the time to spare, Pisew Falls Provincial Park also has another trail and this one leads to the Kwasitchewan Falls, Manitoba’s tallest waterfalls. The hike to Kwasitchewan Falls is not for the faint of heart, even with the designated trails, but for those in search of an adventure and looking for an unfettered existence far away from the noise of everyday life. The trail to Kwasitchewan Falls begins at a suspension bridge that spans the Grass River where you can view more rapids and fishermen casting from the shore. Kwasitchewan is most certainly not recommended to be done in a day. Rather, plan an overnight stay at one of the designated campsites. You always hear about “southern hospitality”, but you’ll be pleasantly surprised to discover that Northerners are just as warm and welcoming. Just beyond Pisew Falls lies Sasagiu Rapids Provincial Park and Paint Lake Provincial Heritage Park, both of which are part of the Grass River system; a waterway with historical relevance to Canada’s fur trading past. If you’re looking for a place to stay while in Sasagiu, you’ll receive a warm welcome at Sasagiu Rapids Lodge, where the owner, Steve Grandbois, helped us settle in, and later treated us to an afternoon boat ride on stunning Setting Lake with views of the boreal forest enfolding both sides of the lake. While Sasagiu is one of Manitoba’s smallest parks, its rapids, opportunities for fishing, flora and fauna – lookout for the beaver dams along the lake and eagles flying overhead – make it an equally attractive destination to other provincial parks. The lodge’s restaurant serves up delicious, authentic Thai cuisine with traditional dishes made from scratch and served in rustic surroundings. If you’re wondering what paradise on earth would look like, it doesn’t get much better than Paint Lake Provincial Park. Think peaceful, pure, perfect. There really isn’t much I could say that could do this park the justice it deserves. Driving in to this park brings a sense of entering another world where time ceases to exist. Many of the campsites are shaded by trees, while the site’s campgrounds and yurts come with dreamy views of the lake. Paint Lake Provincial Park also offers swimmers their pick of two public beaches on either side of a narrow spit of land. The waters here are pristine, calm and inviting. Of course, these aren’t the only places to go swimming on Paint Lake. This park is littered with little bays that lend even more privacy to those in search of it. The opportunities for fishing this lake are endless, and you could easily spend hours on the water without ever noticing just how much time has elapsed. It stands to reason that not everyone would be a fan of camping, but that’s no excuse not to experience this park. Paint Lake Lodge sits right on the lake’s mariner and offers amenities, which include private cabins that are ideal for families within the park and where the owners, Barry and Kathy Ruiter, take the business of food and fishing quite seriously. The lodge’s restaurant offers an extensive menu, and for anyone itching to get out onto the water, Barry, an avid fisherman himself, can be hired for fishing daytrips. Thompson has several points of interest that the city has worked tirelessly to highlight. Just beyond the log walls of the Heritage North Museum lies the Spirit Way Millennium Trail, a two-kilometer pathway that highlights Thompson’s heritage, culture, industry and, of course, its wolves. The Spirit Way has 16 points of interest that averages two hours of trekking. Perhaps the main attraction of this trail and the highlight of entering the city is its towering Bateman Wolf Mural, Canada’s largest photo-to-mural recreation. The mural is haunting, day or night, and more so because no matter where you are in Thompson, once the mural is visible, there is a sense that the wolf’s eyes track your every move. The Spirit Way trail meanders through a forested area, into downtown Thompson and along MacLean Park, beyond the Bailey Bridge (Bailey bridges were a creation of Donald Bailey, designed to be moved and rebuilt speedily during wartime. It was, in no small part, because of Bailey’s bridge that the Allies fought and won the war of 1945), making its final stop near the Burntwood River, which is integral, not only to Thompson’s existence, but to the province. This self-renewing resource flows into the Nelson River and is harnessed to produce more than 75 percent of the province’s electricity. Views of the Burntwood River are possible at one of the Spirit Way’s points of interest, the Northern Aviation Tribute where a Norseman floatplane sits (Norseman floatplanes were the only planes built in Canada). This site pays homage to the mechanics, staff and pilots who risked their lives crossing wide expanses of tundra and boreal forests to bring supplies, machinery and materials to what was once a fledgling city. 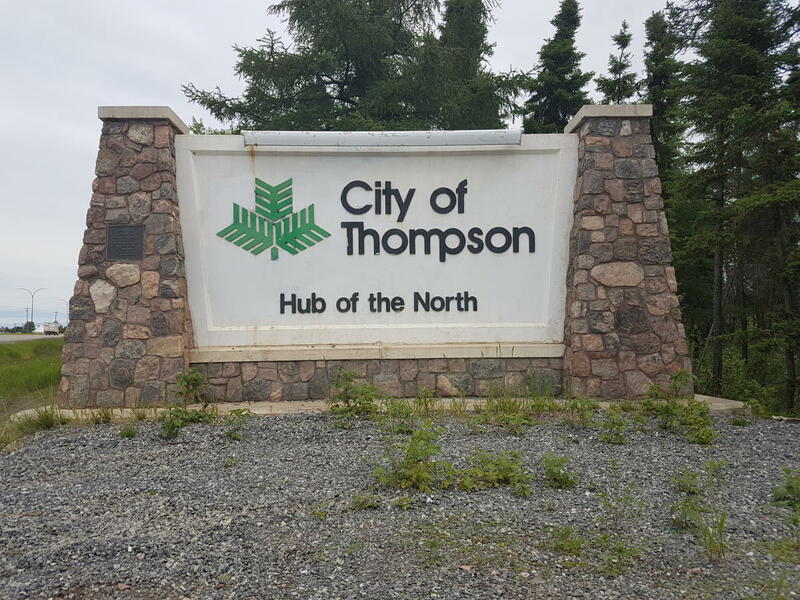 Thompson has come a long way since its earnest mining beginnings of the 1950s. From the natural beauty of its provincial parks, to its river systems that have helped shape Manitoba, to its pristine lakes that rival those of other parks, Thompson is a discovery awaiting the avid adventurer and one that will prove hard to forget.